The Port houses, outposts of each great winery producing wine in the valley far up river, are clustered around Avenido de Diogo Leite, the street running along the waterline in the city called Vila Nova de Gaia on bank opposite Porto proper. Reach them by crossing the Ponte Luís I bridge on foot, or by taking the Metro train service's D line (colored yellow) to the Jardim do Morro station. Once there, you can walk from house to house on and just off the street sampling the glasses on offer in each. All of the commercial names you expect to find are there, and there are restaurants aplenty to in which to keep full. Some strategy is necessary here, though, in that too much Port will leave you feeling ill from the sweetness, and there is no way to navigate all of the houses even in a weekend (to say nothing of a day). Choose the houses you are most interested in, and intersperse your visits with stops for food and still wine at the restaurants. All that said -- and this is the surprise -- I'm not entirely sure I'd recommend that anyone visit this part of town at all. Yes, this is what Porto is known for, but the place is a circus of tourists, everything seems contrived, and there are truly better options elsewhere. We enjoyed our time at Quinta do Noval. At nearby Vasconcellos, however, our host made it clear from the beginning that he wasn't interested in helping us unless we were willing to commit up front to buying multiple of some of his most expensive bottles in an aggressive sales pitch that would make the average American car salesman blush with embarrassment. It was truly one of the worst wine experiences we've ever had, so much so that we walked out before a single drop was poured. A shame, because we'd have ponied up for glasses of his best. Visit the Cathedral that began life in the twelfth century but continued to be architecturally re-invented into the eighteenth. Though not the grand sweeping vibe you get from the continent's more famous cathedrals in (say) Rome, Paris, or Burgos, this cathedral (like the one in Lisbon or Valladolid) possesses a certain aura of authenticity and history around it. Mass is held there to this day. Meander through narrow streets until you either get lost or find your way down to the waterline on Porto's side of the river. There's catharsis in discovery, and one discovers nothing better than that which they find while walking. We took our own advice from the cathedral and found the Porto side of the waterline (as opposed to Gaia's opposite bank) to be lively but less a crush of people. Give it a try. Take the Metro line A (blue) to the port city of Matosinhos, just to Porto's north, and dine at Dom Peixe (reservations recommended, especially on weekends). Walk down the street, Rua Heróis de França, while you're at it and take in some of the other great options for some of the best fish preparation you've ever seen. We wish we had gotten to spend more time in this town, so let us know what else you find here that's great. Do as we did not have any time to do because we squandered so much in Vila Nova de Gaia, and explore the city of Porto north and down the hill from the Cathedral. We took note of the great city that's here -- and how much we left unexplored -- as we were in the car to the train station on our way out of town. Make a point to explore on foot, and let us know what you find! There's a lot of great Port and still winemaking out here amongst the sweeping views. The wineries themselves seem to be getting more and more into wine tourism, i.e. actual venues and services such as tasting rooms and tours structured around sharing their wine with visitors. 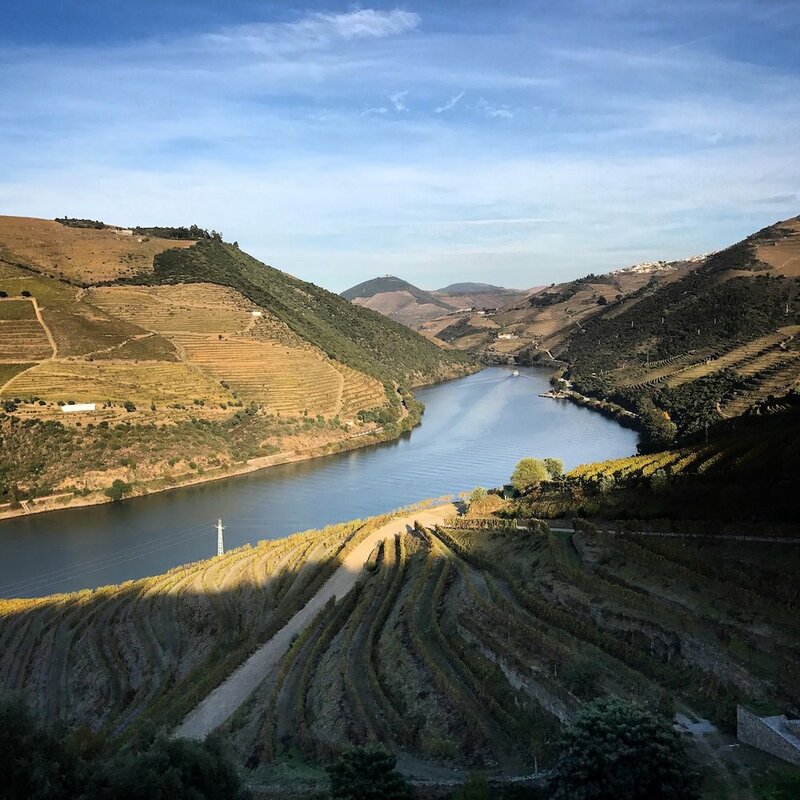 We specifically recommend the aforementioned Quinta do Pôpa for still wines and the absolute best view you'll ever have from a tasting terrace, and Quevedo a bit further west for port wine. Oscar Quevedo, of the winery that bears his family's name, recommended we have lunch at Toca da Raposa in Ervedosa do Douro. After following his advice, we can without hesitation recommend the same to you. 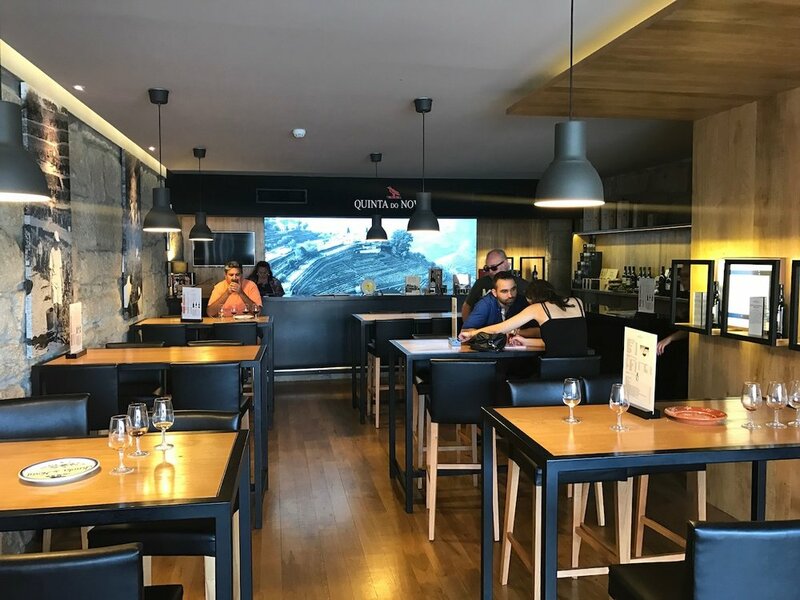 This small but very well appointed restaurant in an even smaller town situated between Quevedo and Quinta do Pôpa features excellent regional food and an extensive list of Douro wines that you can drink by the bottle. We flew in from Lisbon aboard a TAP Portugal commuter flight. National is our preferred car rental provider, but we've found that renting through National in Europe is going to result in you actually getting your car from Enterprise. If you're not accustomed to driving a manual, I recommend that you pay to rent the automatic because the streets here are really tricky. Our choice in this matter netted us BMW that was fun to drive out into the Douro the next day. Google Maps makes getting about in your own car quite easy. Parking downtown is tough (though we eventually found a space), so if you are not staying within walking distance of your destination, consider Uber as an alternative. Porto also features a new modern metro system that functions as subway on its below-ground portions and as light rail when above ground. If you know San Francisco's BART system, the layout of Porto Metro will look instantly familiar to you as it is centered around a central artery where five of the lines run together through most of the downtown. The yellow line D is the outlier, intersecting only once with the other lines at the Trindade station on its north-south route that includes the old city, Cathedral, waterfront, and port house area of Vila Nova de Gaia (so should be pretty useful to you). The other colored lines eventually splinter off into the city's northern reaches, though for our purposes I think you will find the blue line A to Matosinhos and the purple line E to the airport to be most useful. We ultimately departed the city aboard the national railway, Comboios de Portugal, from the Campanhã station (on the main metro artery as well) on our way to Lisbon. This is a fun ride and every bit as convenient as flying between the two cities. Pay the little bit extra to sit in the higher class of service. I'm afraid I can't be of great use on the lodging front, because on this particular trip we opted to stay at the Oporto Cricket and Lawn Tennis Club. We were eligible to stay here thanks to our membership at the Princeton Club of New York, which has a reciprocal agreement with the OCLTC. Nonetheless, if you also have reciprocal membership here, we can certainly recommend it as an inexpensive yet charming and convenient place to stay (good parking, and breakfast every morning). It's very dated, but perfectly reasonable and filled with very kind people. I actually overpaid by a bit more than a euro when mailing a letter, and the lady at the front desk emailed me after I checked out to let me know that she had posted the difference to my account to be deducted on my next stay. Otherwise, Airbnb options downtown seem plentiful, lovely, and affordable. That's likely what we would have done had we not stayed at the club. I've actually become more enamored of Porto as I've written this piece, having gone into it with a rather singular mission of warning you off from the zoo that is Avenido de Diogo Leite. 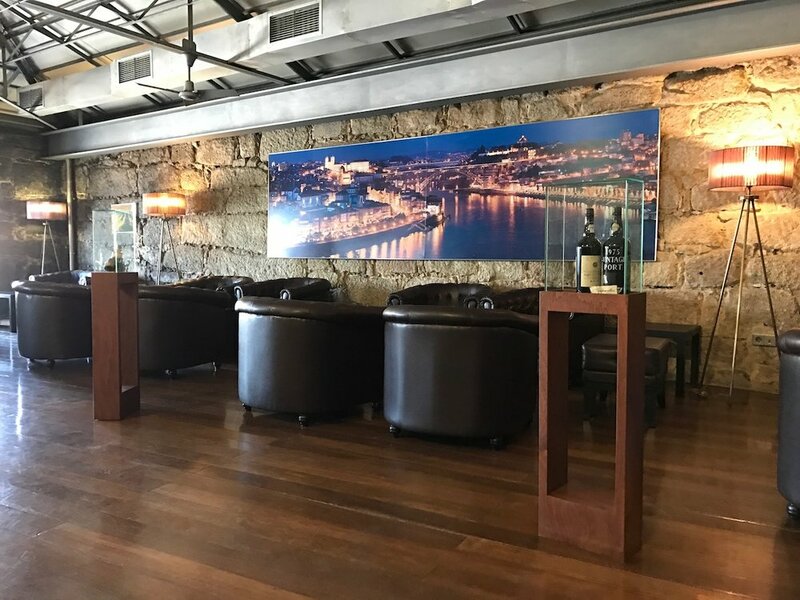 Actually there is a lot to love about Porto outside of that particular crowd, and it's not that we recommend you not go to the port houses at all (this is truly a singular experience for wine lovers), it's that we recommend you not fall into the trap of making it the singular focus of your visit. There's much else to see and eat, and the wineries of the Douro to the west are absolutely not to be missed.